Apple maintains its first position with global tablet shipments of 15 million iPads although its market share dropped to 61% from 94% a year ago, according to Strategy Analytics. Peter King, Director at Strategy Analytics, said, "Global tablet shipments reached 15.1 million units in Q2 2011, surging 331 percent from 3.5 million in Q2 2010. Consumer and business demand for touchscreen computers remains high. Apple shipped a record 9.3 million iPads and registered a healthy 61 percent global tablet market share during the second quarter of 2011. However, Apple has drifted down from 94 percent share in Q2 2010 due to a rising number of competing software platforms." 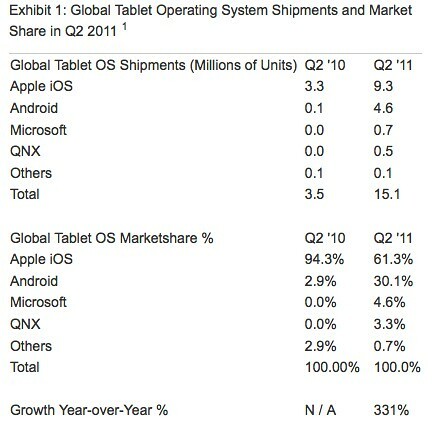 Neil Mawston, Director at Strategy Analytics, added, "Android captured 30 percent share of global tablet shipments in Q2 2011. Multiple Android models distributed across multiple countries by multiple brands such as Samsung, Acer, Asus, Motorola and others are driving volumes. However, no Android vendor yet offers a blockbuster model to rival the iPad, and demand for many Android vendors' products remains patchy. If Amazon decides to enter the Android tablet category later this year, that will bring fresh excitement and buzz to the Android community, but Amazon will need to deliver a truly standout offering if it really wants to make headway against the popular iPad."